All air conditioners have four basic components: pump, evaporator, condenser, and expansion valve. Hot refrigerant vapor is pumped at high pressure through the condenser, where it gives off heat to the atmosphere by condensing into a liquid. The cooled refrigerant then passes through the expansion valve, which lowers the pressure of the liquid. The liquid refrigerant now enters the evaporator, where it will take heat from the room and change into a gaseous state. This part of the cycle releases cool air into the air-conditioned building. The hot refrigerant vapor is then ready to repeat the cycle. state. 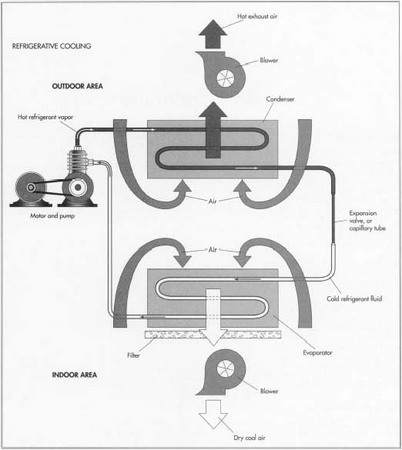 When the cooling medium (either a fluid or air) passes near the evaporator, heat is drawn to the evaporator. This process effectively cools the opposing medium, providing localized cooling where needed in the building. Early air conditioners used freon as the working fluid, but because of the hazardous effects freon has on the environment, it has been phased out. Recent designs have met strict challenges to improve the efficiency of a unit, while using an inferior substitute for freon. Energy efficieny and Noise levels have become important parameters for ACs performance. This is very helpful side through this side, we can get more and more information.We can learn lot of thing about airconditioner.